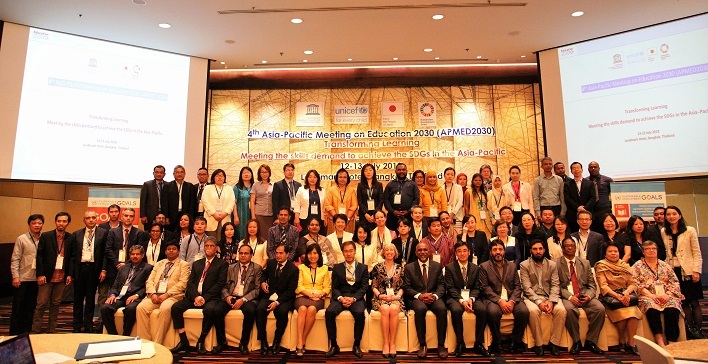 On 12-14 July 2018, UNESCO Almaty Cluster Office participated in the 4th Asia and the Pacific Meeting on Education 2030 (APMED2030) in Bangkok, Thailand. The UNESCO Asia and Pacific Regional Bureau for Education, the UNICEF East Asia and Pacific Regional Office and the Regional Office for South Asia co-organized the meeting. The main purpose of the 4th APMED2030 was to enhance Member States’ understanding and capacity to implement, monitor and report on access and relevance of technical and vocational education and training (TVET), and tertiary education (Sustainable Development Goal 4 Targets 4.3 (equitable access to technical and vocational education and training, and tertiary education) and 4.4 (relevant skills for work)). Over 270 participants from 116 UNESCO Member States and Associate Members gathered in Bangkok, Thailand, to discuss the pertinent trends and needs of TVET and tertiary education sectors, including skills development. UNESCO Assistant Director-General for Education, Stefania Giannini stated that “This is the crucial role of education as a cross-cutting objective in the 2030 Agenda, building sustainable, inclusive and resilient societies, in contributing to improved physical and mental health, better conditions and promoting gender equality and reducing inequality”. The meeting consisted of two parts. The first part was technical sessions to discuss policies and challenges of implementing SDG targets 4.3 and 4.4, which took place from 12-13 July 2018. The 3rd meeting of the Regional Network of the SDG4 National Coordinators followed on 14 July 2018. APMED2030 identified regional capacity needs and strategies to operationalize and monitor the implementation of SDG targets 4.3 and 4.4 and built consensus on a regional action plan. This was a good start to identify regional and national-level responses to challenges facing the implementation of SDG4 before the Global Education Meeting in December. The Central Asian group drafted sub-regional priorities and an action plan for implementing and monitoring SDG4.3 and 4.4 in Central Asia. These included strategies to improve national qualification frameworks and develop the Central Asian sub-regional qualification framework and recognition, validation and accreditation of professional skills and competencies acquired through non-formal learning.